The trajectories of career paths are influenced by factors far beyond the control of footballers. They could enjoy stable injury-free careers, or they could be soaring high in the stars before an unforeseen accident sends them hurtling towards injury purgatory. They could either recover and come back a hero, or they may never be able to rediscover their previous proficiency. Radamel Falcao, one of the best marksmen of the last decade, has had a rollercoaster of a career, with a steady rise accelerating in Iberia before a horrid injury oversaw his apparent decline. But as the old adage goes, form is temporary, class is permanent. 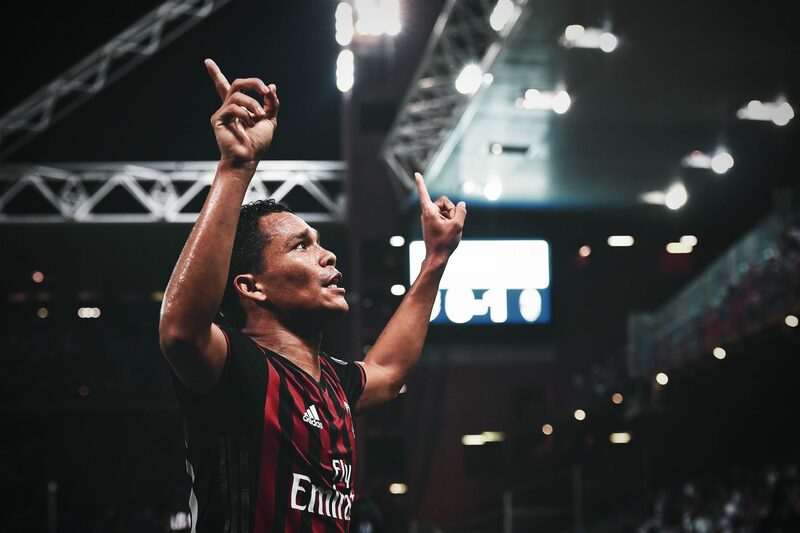 The Colombian, after an unlikely resurrection, is back to his heavy goalscoring self, and the footballing world is blessed for that. The languid Santa Marta is Colombia’s oldest surviving city and is a popular tourist destination for its seaside location on the Caribbean coast. But the city has also given a lot to football; one of Colombia’s greatest footballers, Carlos Valderrama, was born there in 1961. His elegance and creativity as a playmaker, along with his distinctive hairstyle, drove a golden generation to unforeseen heights in the 1990s. 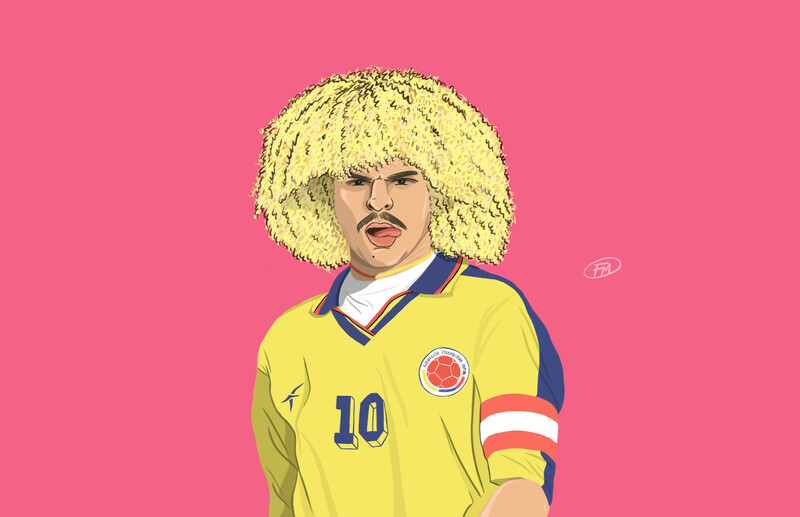 And while no one can touch his iconic status, Falcao was also born in Santa Marta in 1986, just old enough to see the magic Valderrama was weaving for his country. He was named after one of the great Brazilian players, Paulo Roberto Falcão, as a tribute to one of the stars in the 1980s. 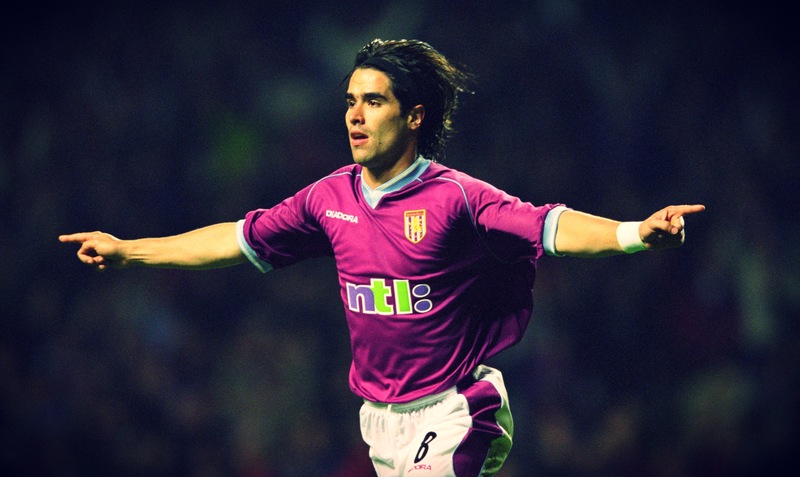 But his first name remained the same as his father – Radamel – who was an uncompromising centre-back with a classic mullet. Even with father and son playing at opposite ends, it was clear where he got his footballing genes from. Radamel’s career was on the wane just as his son entered the world, and his attempt to extend the dying embers of his time on the pitch, which included a stint at Santa Fe, saw the family move to Venezuela. Falcao was just four, and throughout his childhood he watched his father try to resuscitate a fading career. Venezuela has always been a baseball nation. After a bloody nose received whilst playing football, Falcao turned to bat and ball and showed enough promise for his baseball coach to beg his father to let him play. The pace he displayed on the pitch would soon become a regularity on a different kind of surface. When Falcao’s family returned to Bogotá, however, it was football that won. His poacher’s instincts caught the eye of Silvano Espindola, a former teammate of Falcao’s father at Unión Magdalena. He was now running a religion-influenced football school based on his beliefs, and players were picked on playing merit and their character. As Falcao continued to mature on field, he was making progress off it as he developed a close affinity with the Bible. Espindola convinced Falcao to join his Fair Play Academy and decline the overtures of the country’s big guns, namely Santa Fe and Millonarios, the capital clubs. It was bold but represented the trust placed in Espindola. At just 13, he was part of Lanceros Boyacá’s squad, playing in Colombia’s Categoria Primera B, the second tier. But despite his tender years, he was not there to collect a participation certificate. On 28 August 1999, Falcao made history: he was the youngest player to play in Colombian football, coming on as a substitute with 20 minutes to play against Deportivo Pereira. It was a brave decision, but Espindola and Lanceros manager, Hernan Pacheco, were certain of his ability. At just 13 years and 199 days, he passed the test with flying colours. His teammates recognised his special talent and any qualms about playing with a kid were quickly hit out of the ground, baseball-style. His maiden goal came the following year in a 2-0 win, and in just two seasons, Falcao quickly outgrew the club. It was now time to take his game to the next level, and after Millionarios chose not to take up their option to purchase him after a trial, River Plate came calling. Falcao was on his way to set up shop in his third South American country. There is nothing to be learnt in comfort. Or at least nothing of real substance. It is only through toughening it out in a foreign country, dealing with homesickness and separation from one’s family, that character is built. A number of people lack that character, but Falcao wasn’t one of them. Adding determination to his talent, he worked his way up the ranks at River, while also pursuing a journalism degree at the University of Palermo. That degree was a secret, even to his teammates, who never thought Falcao was studying on the side. They never asked; he never told. He was covering all bases, both in terms of his character and his career choices. On 2 October 2005, Falcao was handed his senior debut for River, and he promptly delivered with a first-half stoppage-time goal. It had the air of a player who had been playing for a long time – a calm, composed chip over Independiente goalkeeper Bernardo Leyenda that arrested a three-game losing streak. He made it a brace in the second half, proving to be the match winner. He quickly hit a purple patch, scoring seven in seven while repaying the trust shown by his manager Reinaldo Merlo. But if one thing has averted Falcao’s grasp through his career, it’s luck. He tore the ligaments in his right knee in November against San Lorenzo, ruling him out of the season’s Apertura, then sustained further damage to the same knee in January, ruling him out until September. It was a loss of nearly a year, but Falcao stayed strong. The 2007/08 season became his true breakthrough year at the age of 21, with 19 goals from 39 appearances in all competitions, then he proved that he was no one-season wonder with 16 from 38 the next. Amidst the swirling European vultures, River knew, as always, that Falcao’s time at the club was dwindling to a rapid end. A striker who combined clinical finishing with predatory instincts would always be the target of major clubs. While in the current market he may have bypassed the initial step towards a big club in Spain or England with his record, it was Portugal back then that had the privilege of seeing Falcao make his mark first. He nearly moved to Benfica, but their leaders dithered over an additional €700,000 requested by the Colombian. It all seems foolish now considering Falcao moved to their rivals Porto. He was replacing another prolific goalscorer in Lisandro López, but that didn’t faze him. El Tiempo described Falcao’s attitude and personality as ‘Falcaomania’, with the combination of his calmness and thoughtful nature off-field and his aggression and passion on-field. He was well-prepared for his big move and equipped to execute the duties of a number 9 in Europe. Indeed, goals were his currency at Porto, the club at which he was most prolific. The 2009/10 season yielded 34 goals in 43 appearances, and he somehow managed to top that the following season with 38 from 42. The 2010/11 campaign was especially significant for Porto as they won the treble: the Primeira Liga, the Taça de Portugal and the Europa League, a stunning achievement achieved on the back of Falcao’s goal glut. While in his first year he was prolific in the league, his second year produced goals on the continent, with hat-tricks against Rapid Vienna and Spartak Moscow, another four in the semi-final against Villarreal, and the winner in a final which saw them pitted again domestic rivals Braga. His 17 goals from 14 games was a new Europa League record, beating Jürgen Klinsmann’s 15, and it capped his first European trophy. By putting Portugal on the roadmap again, his successes were significant in many ways, but by setting such high standards, his star shone too brightly to be contained in Porto. Atlético Madrid, their Iberian neighbours, came calling, and despite an extension to his contract in July 2011, Falcao moved to Madrid for a deal potentially worth €50 million. It was the highest fee paid for a player in Atleti history. His record at Porto pales in comparison to his achievements in Madrid, a statement that is both astonishing and an indictment of the scale of Falcao’s dominance in the Spanish capital. Like in Portugal, the Colombian stayed for just two years, but it was a roller-coaster ride, one that kept speeding until the tracks couldn’t contain them. It was his prime years, and he was sure to make full use of it. Typically, Falcao started off with a bang, scoring six in his first three appearances, but it wasn’t until the appointment of Diego Simeone that the team’s performances picked up as well. Atlético were set up to defend deep and counter quickly, but for that to work, you would need a predator to feed on the few chances that came about. Falcao was that and more. Thirty-six goals across 50 appearances in 2011/12 took the definition of plundering to another level. And he was the king of the Europa League, a winner in consecutive years. Thirty-four goals in 41 appearances in the following season continued that red-hot streak, encapsulated by a first-half hat-trick in the 4-1 victory over Chelsea in the UEFA Super Cup. He scored five against Deportivo and also won the Copa del Rey. He was simply the best at what he did. He outdid Sergio Agüero and Diego Forlán, the two he replaced, by a considerable margin. The only shame was that he was not there for Atlético’s title triumph the following year. His star shone too brightly for the Vicente Calderón and off he moved again. He had the world at his feet but found himself in the Principality of Monaco. With a Russian billionaire ready to spend and an ambitious project, he took his talents to the tax haven. The orchestrator of the deal was Jorge Mendes. It was a move that took people by surprise, but Falcao had little control over the numbers – not that it mattered. At €60 million euros, it was a massive deal, though you get the feeling Falcao would have rather stayed in Madrid than moved. Nevertheless, he started off strongly in France, though troubled by injuries. It was nothing compared to what lay ahead. Monaco played fourth-tier Monts d’Or Azergues in the Coupe de France in January 2014, a straightforward cup game. Falcao netted early, but primary school teacher Soner Ertek dived into him in the 40th minute to stop a sure goal. It was a poor tackle, albeit from an amateur, but Falcao tore his ACL. It was heartbreaking for the Colombian, not least because the World Cup was six months away, and he was all but ruled out of the prized event. For a player on top of the world, it was a crushing disappointment. Ertek received Escobar-esque threats from Colombia, but that couldn’t ease the pain: Colombia would take part without their star striker. In the end they performed admirably, thanks to fellow Monaco star James Rodríguez, but one can only wonder what they could have done with Falcao. His recovery was long and painful, but the Colombian is a fighter. The fear was that he would not hit the same peaks as he did post-injury, and his time in England did nothing to disprove that theory. When he signed for Manchester United, it was a major deadline day arrival; the fans couldn’t believe it, and the media was in a frenzy. After all, a world-class finisher is always welcomed. It was only a loan, but still exciting. He started off with promise, with a rapturous applause on debut – memories of his Madrid exploits still fresh in the mind. But it was obvious England wasn’t the place to recover from such an injury. He was sluggish, often aloof, and a shadow of his former glory. Louis van Gaal’s demotion of Falcao to the under-21 team was criticised based on reputation, but on form, it made sense. He was one of the worst signings of the season, and he returned to Monaco with real regret. He was back in England like a boomerang, though. United giving him a chance was understandable, but for Chelsea to do so was like the work of a desperate madman, trying again despite logic saying otherwise. It was – again – the work of Mendes, but it was also an ego project for José Mourinho, eager to coax some form out of Falcao and prove himself as the best. Ironically, though, Mourinho was sacked in December, and injuries took their toll on Falcao. He only scored one goal in 12 appearances, which represented a worse record than his time at Old Trafford United, where he scored four in 29. That, after four consecutive seasons of over 30 goals, was a shame. That he couldn’t cut it in England remains the only blip of his career. Considering his great-grandfather, George King, was a Yorkshireman, the circle couldn’t be closed. Like a vanity project gone wrong, Falcao questioned his abilities as he returned, once again, to Monaco, with no suitors willing to take the plunge. His parent club had changed, with a youth-centric policy now in place, but Leonardo Jardim saw the benefits of an experienced head in the squad, appointing him as captain. It was time to try and regain what he once had. Surrounded by a host of attacking starlets, he was no longer the crown jewel, and it suited him perfectly. The story is remarkable: 21 goals in 29 league appearances, seven in 10 Champions League games – only his second season in it – and 30 in 43 overall. His goals propelled Monaco to the Ligue 1 title and a Champions League semi-final – an astounding achievement for the team but also for the striker. His true strength had not died. Compared to his toils in England, Falcao was a man reborn from the ashes. From Martin Keown’s “it was another night of nothing from Falcao” to a Ligue 1 triumph, it was a victory against the odds on a personal level. It’s true that form is temporary and class is permanent; while Falcao’s time in England flattered to deceive, it was not the end. He’s no longer the world’s most coveted number 9 but he’s as lethal as ever. This is the revival of the world’s best striker at one point, with his instincts as sharp as ever. From heaven, Falcao fell into hell, but he’s clawed himself back to the real world. There has been no scandal, only effort and hard work, and for that he deserves the respect of the football world.